Foot Fishing the Coastal Bend is the most comprehensive publication focusing on fishing the waters around Corpus Christi Bay without a boat. 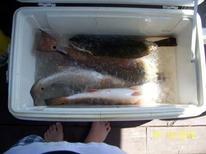 FFCB covers fishing locations in Corpus Christi Bay, Redfish Bay, Corpus Christi ship channel, the Upper Laguna Madre, Oso Bay, Nueces Bay, and the Gulf of Mexico surf. Sportsmen visiting the Corpus Christi, Portland, Aransas Pass, Port Aransas, or Padre Island areas will find that FFCB will give them a greater advantage when planning their fishing strategy. Whether you want to wade fish one of the bays or the surf, or if you wish to stay dry and fish from the bank, a pier or jetty; FFCB will help give you the tactical advantage needed to find ideal fishing spots. 1 long stretch of the Gulf of Mexico beach. 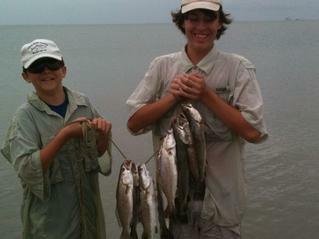 FFCB targets non-boating fishing locations along the Coastal Bend and explains the waters of these areas and what fish you can expect to catch, not so much about how to fish and what tackle and gear to use while fishing these waters. Anyone that fishes the area once/twice a year or has never fished the Coastal Bend will find FFCB a tremendous help in figuring out where to fish. FFCB is available in Ebook & paper & ink form right now, while a mobile app is being developed as a part of the purchase. Ebook is PDF file & T.O.O. offers unlimited text support and email assistance with the purchase of either electronic or paper edition of FFCB. When a buyer texts T.O.O. where they will be fishing and the type of fishing they want to do, T.O.O. will return a text with a suggestion or two on where to fish. Same support is offered via email, we'll offer suggestions based on what fishing folks want to do and what they've got going on. For roughly the price of a couple of quarts of live shrimp or a few dozen croaker, the combination the FFCB information from the book and text/email support, (along with the mobile app when it's ready) makes this an outstanding way to plan your fishing along the Coastal Bend . Save money, time, and paper by buying a FFCB eBook! 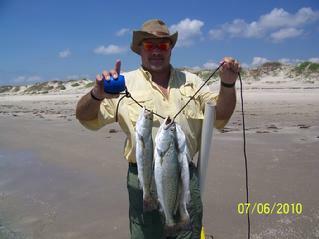 Both options include unlimited text/email support on suggested fishing locations along the Coastal Bend! Please click on the appropriate PayPal link below and include your mailing address if purchasing a print copy of FFCB. We truly believe that FFCB will greatly increase your chances having successful shore, pier, and jetty fishing trips along the Coastal Bend.